But understanding the value a customer has to your business over time is critical to making smart, cost-effective decisions about where to spend money on advertising and marketing. What market segments to target first. How much you should be willing to spend to acquire a customer. What types of customers you don’t want to spend money on. How much you should spend to retain existing customers. 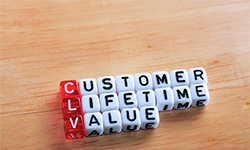 Basically, CLV defines – in dollars – today’s value of the future profits your business can expect from a customer over the entire time they remain your customer. That time could be a day — or a decade. It’s important stuff – especially for businesses that have been lured into the daily deals game and may be sacrificing long-term relationships for a few quick bucks. Pick a time frame; say 10 years. Take the total annual revenue you expect from a customer – including expected changes up or down each year – and add them up. Subtract your expected costs of attracting the customer in the first place, your cost of goods sold, and the costs of servicing the customer each year. Apply a “discount rate” (usually 10-20%) to recognize that a dollar you hold in your hand today is worth more than one you get in the future. One thing you’ll quickly discover is that common sense is correct: The longer you keep a customer, the more profit they produce. That’s true most of the time. But not all customers are the same. They cost different amounts to acquire, produce different amounts of revenue and stay with you different lengths of time. They also require different amounts of care and feeding. If you don’t account for these differences, you can end up paying to acquire and keep unprofitable customers. In the end, you’ll want to spend your money to acquire and keep the best (most profitable) customers possible. Think of it this way: Does it make sense to spend, say, $40 to attract a new one-time customer (with a coupon offer, for example) while spending nothing to keep a customer you already have? Many business owners are familiar with a variation of this known as the 80/20 rule – that 80% of profits come from 20% of the customers. Yet, conventional wisdom tells businesses to treat all customers alike. That’s a problem because all customers are not created equal. Being CLV savvy helps you focus your marketing and spending on customers who bring real value to your business. 1) Your marketing budget is limited. It makes sense to deploy limited resources where they count the most – with customers who represent the highest profit to your business over time. 2) Even small percentage changes in customer retention produce large increases in profit. “Customer equity” in a business – which is the sum of all customer CLVs – jumps 50% with just a 10% increase in retention. Repeat sales are what send profits soaring! 3) Knowing CLV helps you see things in new ways. For example, while certain types of print advertising may be out of favor, it might be that customers who find you there have higher CLVs than those who click a digital ad. Knowing this would help inform your marketing decisions and spending. Several CLV calculator tools are available free online. This one, from Windsor Circle, is a free download. Harvard Business School Publishing also offers a free online CLV calculator here. Or simply do a Google search for “CLV calculator” to find others.